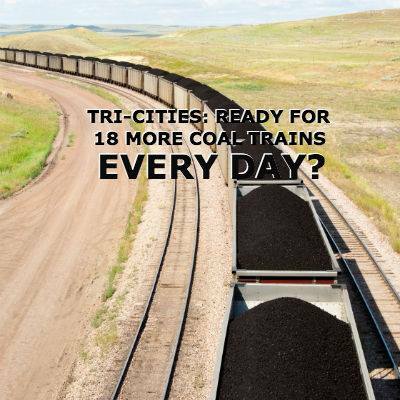 Eastern Washington and northern Idaho activists are gathering in Spokane at noon on Tuesday, October 1, to carpool, coordinate, and participate in a public protest and scoping hearing in Pasco, Washington, about the Millennium Bulk Terminals proposal for coal export facilities in Longview, Washington. The Tri-Cities area, where a unit train derailed and 31 of its cars spilled six million pounds of coal on July 2, 2012, could experience up to 18 more coal trains rolling through these communities every day. The Longview coal port and accompanying train traffic would threaten the human, environmental, and climate health as well as the public safety and economic vitality of the region.